Q1: Where can I buy a 3D-Chess-Set? eBay is always worth a try. But you have to be careful. 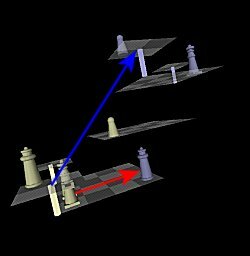 There exists quite a variety of different 3D-Chess variants (take a look at the internet encyclopedia wikipedia). 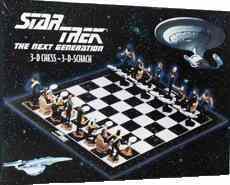 And even worse sometimes a 2D-Chess-Set is offered as STAR TREK 3D-Chess only because the pieces are three-dimensional (as pieces of most chess sets are). The most inexpensive solution is still to build your own 3D-Chess-Set. A Manufacture Guide is available on this homepage, as well as on the pages of Michael Klein and Peter Zumstein. Please note that the three boards have different appearances. The decision for one solution over another is a matter of personal taste and capability. Q2: Assuming the attack boards are located in their initial positions (QL1, KL1, QL6, KL6), and there are only a white rook at e0KL1 and a black pawn at e8KL6 on the board, is it possible that the rook captures the pawn? because 'non-existent' squares are also part of files, ranks and diagonals; see article 2.8. But the pawn can't move to e1KL1. The pawn could only land on e7 (or e6 if it hasn't been moved before); see article 3.4. As thoses squares are non-existent in the situation above, the pawn has no legal move (excepting an attack board move). Q3: There's a white rook on d1W, a white pawn on d3N and a black queen on d4W. Can the rook capture the queen, as you can draw a straight line? not by the rules on this site, see article 3.1(c):"...A piece, on any individual square, blocks the abiltiy of other pieces to move at all levels ...". It was decided like this deliberately, so the rules would not become too complex. You could also draw a straight line between a piece on d0KL1 and another piece on d4KL5 without touching a piece on d3N. Should this move be allowed? Q4: What's the easiest way to find out if a move is allowed or not? The best thing is to look at the 3D-Chessboard from the top. This way the three main boards form a single "flat" board, 8 squares long and 4 squares wide. With the attack boards you also get a border, so the board appears to be 10 squares long and 6 squares wide. Some of the 'border squares' are part-time or permanently non-existent; see a previous question and article 2.8. If you imagine the board like that, any move which can be made in a standard chess game (flat board), can be made in three-dimensional chess as well. But in three-dimensional chess two pieces can occupy the same square (provided they are on different levels); see article 3. Q5: I've heard that a pawn can be moved into the 'Promotion Zone' in three quick moves of an attack board. Is that possible by the rules presented on this site? And how does it work? assuming the move of the attack board isn't blocked by other attack boards or stopped by the opponent placing a second piece on the attack board; see article 3.6. Example: There's only one attack board on QL1 with a pawn on z1QL1. The opponent doesn't make any move (how could he, he doesn't even have a king *smile*). Three possible moves could be: QL3, QL5 (or QL4) and QL6. Now the pawn reached z9 and will be promoted. Q6: What means the phrase "regardless which piece that is" in article 3.6: "... An attack board can only be moved, if it holds no more than one piece (regardless which piece that is). ..."? As there pretty seldom are good opportunities to move an attack board, we decided in our rules to permit "one piece" instead of merely "a pawn". Q7: Is it possible to flee a 'check' by simply moving the attack board on which the king resides? if the king is no longer 'in check' after this move, and if the rules for an attack board move (article 3.6) are correctly followed. Q8: Is it possible to move a king by an attack board move below (or above) another king? because the kings don't attack each other, as vertical moves are forbidden; see articles 3.1(d) and 3.5(b). Example: All attack boards are located in their initial positions (QL1, KL1, QL6, KL6), white king on d0KL1, white pawn on a2W, black king on d4W (or d4N). White is about to move and plays KL2. After that, the black king can no longer move. Nevertheless the game is not a draw / not a stalemate (see article 5.2), because Black can still move at least one attack board. Q9: Is it allowed to castle on the Queen's side, if a square between the king and its destination square is attacked by one of the opponent's pieces? Example: White is about to castle and Black has a rook on b1W, so Black attacks b0. see article 3.5(a)(ii). The case in question is purposely not listed, as it is not an exception to castling. Our consensus is, since pieces can't be placed on 'non-existent' squares, it follows that a piece cannot be captured or attacked on such squares. Q10: If an attack board has pieces of both colours on it, to whom does it belong? That's irrelevant, since the attack board cannot be moved! Q11: If White captures a black attack board (see article 3.6: " ... Attack boards are controlled by the player whose piece is located on it. ...") and then vacates it, does the board revert to Black's ownership or remain White's? see article 3.6: " ... Empty attack boards are the property of the original owner (marking). ..."
Q12: If a black attack board is controlled by White (or vice versa), which way is considered to be forward: the way of the original owner of the board or the way of the controller of the board? Well, that's not specified in the rules, as we thought it would be obvious that the direction is defined by the controller. Q13: Is it possible to hold more than one queen? just as in 'normal' (flat) chess played under the FIDE Laws of Chess; see 3D-Chess article 3.4(e)(I). Two queens of the same colour within one game are not so rare. In theory you could have up to nine queens, your original one and eight promoted pawns. In any event, this would be very unlikely. Q14: How can the pawn on z1 (e1, z8 or e8) move? 1) The pawn might capture an opponent's piece on a2. 2) Another attack board might move to QL3 and the pawn might move to z2 or z3. 3) After three pieces have left the attack board QL1, the attack board might move during play to the king's side, thus placing the pawn on file 'd'.